MSV: BoE Trustee Ruth McAllister - "Frank Raia is a liar, and Peter Biancamano knows it!" BoE Trustee Ruth McAllister - "Frank Raia is a liar, and Peter Biancamano knows it!" On Tuesday night at the Council At Large Forum, Frank Raia lied about the Board of Education budget. He claimed that the budget was 64 million for only 2000 students. This is an outright lie and as a former School Board trustee he knows it! The 64 million dollars serves over 3100 students in Hoboken, because the 64 million includes monies for all three charter schools and the public Pre-K program. Frank Raia should know that holding the tax levy flat for three years and only increasing last year is miraculous considering what we have done over the last 4 years. When Kids First won three seats on the Board of Education in 2009, defeating Frank Raia who was running for re-election, we obtained a board majority and were able to really see what was happening in the district. Everyone has heard about the 29 audit violations but that is only the finances. It may have been okay with Frank to have children attend Hoboken public schools with 20 year old textbooks but it was not okay with Kids First that Hoboken children attend schools with negligently outdated books. Since 2009 we have replaced virtually every math, language arts, social studies, history and science book in the district, K through 12. We are funding a capital improvement plan that includes the construction of science labs in Connors, new bathrooms in the High School, a High School culinary arts center, upgrades to the theatre, renovations to the HS gymnasium, new technology in all buildings, amongst other things. Prior to 2009, there was no capital improvement plan in place and that was why our buildings were in disrepair despite the hard work of our facilities director and staff. Frank Raia’s outright lie is abhorrent, but more despicable is his running mate, Peter Biancamano’s silence at Frank’s lie and its perpetration in their literature and advertisements. Peter Biancamano is on the Board of Education Finance committee and is well aware of the two most basic facts: total budget and total students served in that budget. Either Peter is purposely allowing Frank and the Tim Occhipinti team to lie about the School Board budget or he is incapable of understanding the simple math and user friendly materials that the rest of the Board of Education trustees and the public understand. Most people probably assume that they know who my votes for Council and vote for Mayor will go to, and they would be right; Bhalla, Mello, Doyle and Mayor Dawn Zimmer because they have earned my trust and have the best intentions for our community. But for those of you that have not made your choice, I would strongly suggest that you do not vote for Frank Raia and Peter Biancamano because the last thing we need is politicians that lie publicly about things that are easily checked, it means you cannot trust them. And if lies do not bother you, how about the laughter at the debate when Frank Raia said he was for Vote By Mail? There is an old saying ... If it walks like duck and talks like duck? Lastly, if Brittany “lives here for 8 years but only registered to vote last year” is reading this, I can only assume that with your only recent interest in local issues (as indicated by your registry last year), you are probably ignorant to the history of corruption and mismanagement that this town has endured for decades prior to the current administration. As a special education teacher, I believe that your heart is in the right place, I would be happy to meet you for coffee so you can explain the importance of an honest Board of Education budget to your team. 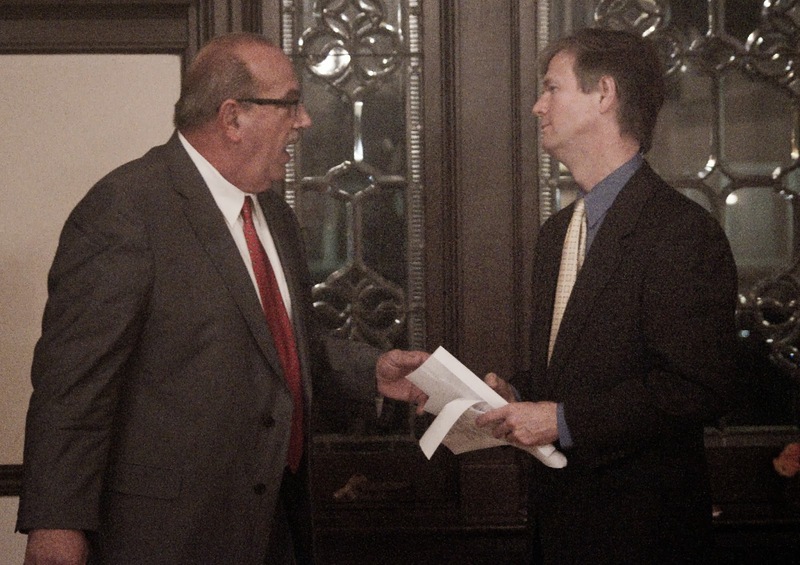 After the council forum, Frank "Pupie" Raia presses his position to forum moderator Bob Bowdon. Raia changed a question on the City budget to attack the BoE budget. BoE Trustee Ruthy McAllister took strong issue with Raia's remarks in today's MSV guest piece.